Description Ideal for transporting materials from area to area. 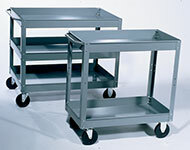 4” heavy-duty hard rubber casters, Two casters swivel. Overall height 32”. Gray in color. 16" x 30". 3 Trays.